Review posted October 10, 2018. Tundra Books, 2017. 32 pages. Here’s a wonderful picture book full of early math concepts that can be used in many different ways. It’s also good as a story (Well, a little bit – a story about a boy tidying up), and for those children who enjoy super-detailed illustrations (like I Spy and Where’s Waldo). 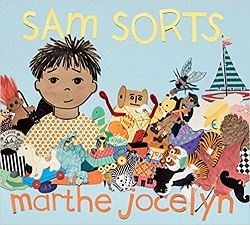 Mainly, it’s about Sam’s quirky collection of one hundred favorite things and the many different ways they can be sorted and counted. First he finds Obo the robot, one of a kind. Then two snarling dinosaurs, three little boxes, and four fake foods. How many things is that? Sam gathers many things in various groupings. I like the page that shows a Venn diagram with three circles made of string. Spider Rock joins the other rocks. Sam’s favorite rock is the round one. He looks for more round things. Two of the buttons are exactly the same. What else comes in twos? The Venn diagram shows rocks in the first set, then round things, then things that come in twos. There are things in both intersections. There are things that don’t fit any of those categories on the outsides. Things continue to be sorted in various ways. Another way Sam makes a pair is by finding a rhyme. Some things match because they have stripes. A few have dots or holes. Only one has checks. The snake is striped AND green . . . But if nothing else, this introduces the concept of sorting and sets and looking at things in different ways. This is a wonderful early math activity, and I love the playful approach.